"Toni Morrison's speaking voice contains the same musicality as her prose, and the combination of the two results in a nearly sublime experience." ". . . it's a storyteller's voice - older than sound recording, older even than print itself." "Morrison's remarkable talent for storytelling naturally lends itself to the spoken word." Toni Morrison's first novel, The Bluest Eye (1970), was acclaimed as the work of an important talent, written--as John Leonard said in "The New York Times--in a prose "so precise, so faithful to speech and so charged with pain and wonder that the novel becomes poetry." Sula leaps it and roams the cities of America for ten years. Then she returns to the town, to her friend. But Nel is a wife now, settled with her man and her three children. She belongs. She accommodates to the Bottom, where you avoid the hand of God by getting in it, by staying "upright, helping out at church suppers, asking after folks--where you deal with evil by surviving it. 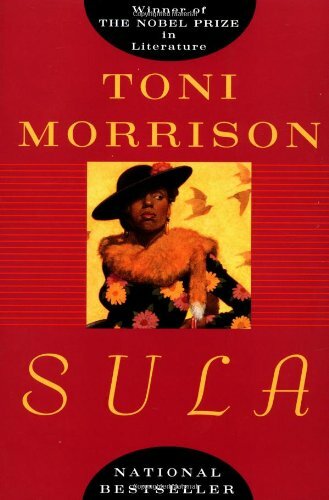 In clear, dark, resonant language, Toni Morrison brilliantly evokes not only a bond between two lives, but the harsh, loveless, ultimately mad world in which that bond is destroyed, the world of the Bottom and its people, through forty years, up to the time of their bewildered realization that even more than they feared Sula, their pariah, they needed her.